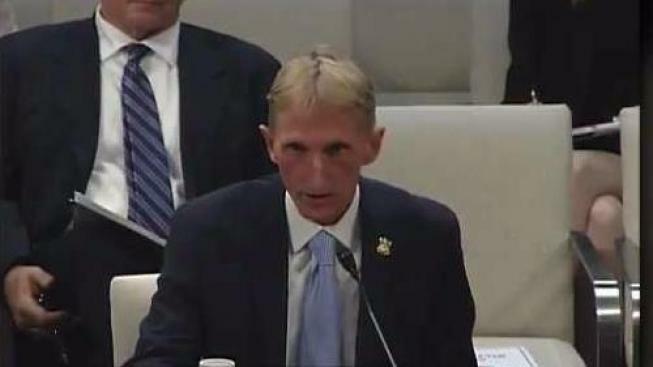 Boston Police Commissioner William Evans was on Capitol Hill on Wednesday to attend a hearing which focused on the importance of reporting suspicious activity in a post 9/11 world. Evans talked about a Homeland Security program which he says saved lives during the Boston Marathon bombing. Boston Police Commissioner William Evans spoke on Capitol Hill Wednesday, sharing lessons learned in Boston in fighting terrorism. The congressional hearing, before part of the U.S. house committee on homeland security, focused on inter-agency cooperation, training, the importance of reporting suspicious activity in a post-9/11 world. Relationships, training and coordination were key lessons of a federal homeland security program launched in response to the failure to see and prevent the 9/11 terrorist attacks. Those are lessons Evans said saved lives during the marathon bombing. Specifically, he pointed to the relationship among local police and the FBI, as the key reason more people didn't die after the marathon bombing. Those relationships and shared intelligence he says thwarted a planned mass shooting at a national Pokemon tournament at the Hynes Convention Center in 2015. “We were able to catch them and get two high powered rifles before they shot that up,” he said. Evans pointed to success with major events like sports parades, the free speech rally last month and recently stopping the ms13 gang. Boston police work with a range of entities like the area's universities and hospitals to defend places that could be soft targets for terrorism. “We trained at Fenway Park, we trained at the TD Garden Center. For suspicious activity as well as what should happen during an active shooter,” Evans said. Evans and others law enforcement who testified emphasized funding for the training and coordination is critical for terrorism prevention. The money trains officers to spot who might be carrying an explosive or a weapon... and toward training the public with programs like “see something say something”.